For employee safety, we do not service fixed-lid rolling containers used for mixed solid waste. Please ensure that garbage is properly contained. Otherwise you may be inviting animal intrusion, wind swept litter, ground contamination, not to mention extra expense. Be especially diligent containing polystyrene packing material (i.e. packing peanuts), which should be bagged and not left loose in boxes. Never place hazardous wastes such as motor oils and household chemicals in your regular garbage. Please call our office or check online for detailed information on hazardous waste programs in your area. Please call our office at 530-583-7800 to start service. Your attention to a few details, such as these mentioned below, can help keep your bill as low as possible. Place your garbage within twenty feet of the county maintained roadside by 7:00 am. If you share a common access or place garbage in a common location, be sure to mark all cans and bags with your name or house number to ensure the driver accurately records what is collected. Individual cans, bags, or containers must neither exceed 32 gallons in volume nor 60 pounds in weight. Cans should have tight-fitting lids that are not screw top. We do not service the screw-top “bear resistant” cans. Can averaging has ended. Each resident is allotted one can of trash per week rather than the previous “can averaging” program which allotted residents 13 trash cans to be used throughout the quarter. If you have more than your regular household trash to be picked up, e.g. yard clean up or appliances, you need to call our office at 530-583-7800 and give authorization to pick up these additional items. We strongly recommend you purchase a bear shed. TTSD clean-up efforts for garbage mess will incur a charge. Call us or click for a list of local bear shed vendors. Place recycling (blue bags) beside garbage. Garbage routes run normally on all holidays. If your collection day falls on a working holiday, please place garbage out by 6:00 am. For holiday hours for the Eastern Regional Transfer Station, known commonly as the MRF, visit the Hours & Locations page. Our administrative offices are closed all or most holidays, so be sure to contact us ahead of time regarding questions or special requests for those days. In the event of severe winter weather, routes will be completed at the earliest opportunity. If town and county roads to your neighborhood location are impassable, we will generally attempt to gain access throughout the day, but may find it necessary to return at a later date. Maintaining clear access to garbage containers. Clearing all snow and ice. Snow plow services do not necessarily keep pathways clear to garbage containers. Ensure cans remain visible to our driver, but are free from the path of any snow plow (if you’re placing cans out). Lids should always be securely fastened (no screw lids) to prevent animal intrusion or water absorption. Bear sheds (enclosures) must have clear access; clear access means no snow hanging over the top, no snow “tunnel”, no snow steps, no snow berms and no ice on pathway. During freezing weather, bear shed doors may freeze shut, TTSD employees will not force doors open. During occasions of freezing weather, customers may open the sheds themselves and leave open a few inches on the morning of collection to ensure access is available to TTSD. 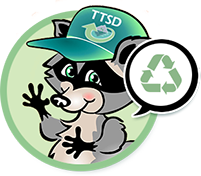 Each week TTSD drivers record the number of cans collected at your residence as well as extra amounts of garbage placed beside or on top of a garbage can. Additional services required are also noted. At the end of each quarter, the computer calculates your average level of usage for that three-month quarter. A customer’s account calculated on a one-can basis typically allows thirteen cans in each quarter. Amounts over the allotted thirteen cans incur an extra can charge or equivalent. TTSD also offers a two can rate, allowing customers twenty-six cans in a thirteen-week quarter. As a TTSD customer, you can participate in our free curbside Blue Bag Program. Simply place dry, clean recyclable materials in blue plastic bags, which may be purchased from local grocers and hardware stores. Blue bags must be tied and set next to the trash containers, not inside of a can. TTSD collects these blue bags for processing at the Eastern Regional Material Recovery Facility (MRF). As a reminder, the MRF sorts all materials for applicable recyclables whether you utilize blue bags or not. We also offer free Christmas tree recycling, where trees are collected following the holidays (with certain restrictions). Free Household Hazardous Waste Disposal is available throughout the summer months if you schedule an appointment and bring your acceptable wastes to the special facility at Eastern Regional Transfer Station. We welcome you to our independent family-owned business and encourage you to call us if you have any practical considerations or placement questions. El Dorado Residents may find more information at edcgov.us. Garbage service is mandatory in Placer County, even if you only use your home one day a month. You may discontinue your service only if you are not using your home for one entire calendar month or longer. You must call our office and notify us in advance to discontinue service, as we do not adjust in arrears. If your home is not on service and is found to be occupied, we are required by Placer County ordinance to automatically start your service and therefore bill accordingly. Please call our office at 530-583-7800 if you have any questions regarding your service that are not answered below. Please call our office at 530-583-7800 to start service. Set up your online bill pay and customer portal by clicking “My Account” above. You may also schedule overages pick-ups online, or download free yard waste drop off coupons through your customer portal account. Place your garbage within 28 feet of the county maintained roadside by 7:00 am. Individual cans, bags, or containers must neither exceed 32 gallons in volume nor 51 pounds in weight. Truckee residents have the opportunity to schedule four free trash overages per year. Customers must schedule the overage via the online portal in advance of their pick-up day to schedule an overage and may then put out up to 3 extra cans (96-gallons) of additional waste on their normal service day. Truckee residents also receive two free bulky item pick-ups each year. Bulky items include household furniture and e-waste but must be under 200 lbs. Residents must call TTSD in advance to schedule a bulky item pick-up. Customers with recycling carts should place clean recyclables into the cart without using blue bags. Recycling carts should be placed curbside by 6:00 am every other week on trash collection day. The cart must be 3 feet away from other objects, including your trash can, mail box, or cars. Learn more about recycling carts and find a service calendar at keeptruckeegreen.org. Truckee customers can also participate in our free curbside Blue Bag Program. Simply place dry, clean recyclable materials in blue plastic bags, which may be purchased from local grocers and hardware stores. Blue bags must be tied and set next to the trash containers, NOT INSIDE a container. TTSD collects these blue bags for processing at the Eastern Regional Material Recovery Facility. Additionally, customers who have a blue recycling cart may also utilize blue bags placed out alongside their trash. Blue bags are collected in the same vehicle as household trash, not with the blue recycle carts. Two communal recycling dumpsters will be set up during the months of July and August. Locations will be posted during the service months. Truckee residents can opt-in to receive up to three 96-gallon green waste carts. Go to keeptruckeegreen.org or call TTSD to request green waste carts. The green bag program ended June 30, 2018; green bags will no longer be collected free of charge. Yard waste materials should be placed directly in the cart without bags. Green waste carts are serviced from May 1 to October 31, every other week on trash collection day. Green waste carts should be placed curbside by 6:00 am 3 feet away from other objects. Learn more about green waste carts and find a service calendar at keeptruckeegreen.org. Drop off info: Truckee residents can drop off up to 6 yards of green waste materials each calendar year at Eastern Regional Landfill from May through October. Residents can allocate their 6 yards among up to 6 different deliveries. A contractor can also drop off residential yard waste on behalf of a Truckee resident. The resident may download and print unique coupons to pass along to their contractor so the contractor may drop off the green waste in the resident’s name. You can obtain your coupon codes online after you set up your customer portal account. Dumpster rental info: Truckee residents can rent one 6-yard dumpster for green waste materials for one week up to two times per year. Green waste dumpsters are available from May through October at a discounted rate. Please contact TTSD to arrange this service. Each week TTSD drivers record the number of cans collected at your residence as well as extra amounts of garbage placed beside or on top of a garbage can. We offer free Christmas tree recycling, where trees are collected following the holidays (with certain restrictions). Free Household Hazardous Waste Disposal is available throughout the summer months if you schedule an appointment and bring your acceptable wastes to the special facility at Eastern Regional Transfer Station. Batteries can start fires when their terminals touch which makes them dangerous if they are thrown in the trash like other household items. Please cover each battery end with electrical tape and place batteries in a plastic bag on top of your trash can. The batteries will be collected free of charge.